Believe it or not, it's true! Segar's old boss, (Opera House Manager), J.William Schuchert, was the model for J.Wellington WIMPY as noted in Forrest "Bud" Sagendorf's (1979) - "POPEYE: The First Fifty Years" book and other local sources. Schuchert physically resembled WIMPY and had a fondness for hamburgers. It has been reported that WIMPY's demeanor came from another source. The obese moocher's personality was borrowed from an underhanded fight referee in Ocean Park, California. Elzie and Myrtle Segar were boxing fans and frequented Ocean Park. OLIVE OYL's real-life persona was Dora Paskel. Ms. Paskel was the proprietor of a general store in Chester. She was tall, lanky and wore her hair rolled tightly in a bun. She was also reported to dress like OLIVE OYL, wearing the popular button-up shoes of that period - just like Ms. OYL! POPEYE was based on Frank "Rocky" Fiegel as noted in Forrest "Bud" Sagendorf's (1979) - "POPEYE: The First Fifty Years" book and other local sources. Fiegel was a local tough guy. He was small and wiry, just like POPEYE! There are many local legends told of his incredible strength, and his ability to fight. On September 7, 1996, Fiegel's formerly unmarked grave was finally marked with a headstone. The marker is inscripted with the 1929 version of E.C. 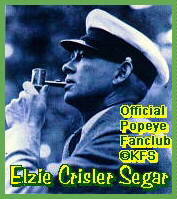 Segar's Popeye character. This version of Popeye most resembles his legendary 'real life' counterpart. Dora Paskel is regretably not mentioned in Sagendorf's book or "A History of Chester, Illinois (1829-1979)", but Bill Schuchert and Frank Fiegel are noted in both sources. In fact, these two gents are also included in the inscription on the POPEYE statue that is diplayed in Segar Memorial Park. Come visit us, and take a look! The park is located near the Mississippi River.